Chloe was a superior athlete in multiple sports. She was on the varsity golf team for two years and played four years of both Varsity Basketball and Soccer for Suffield High School from 2003-2007. 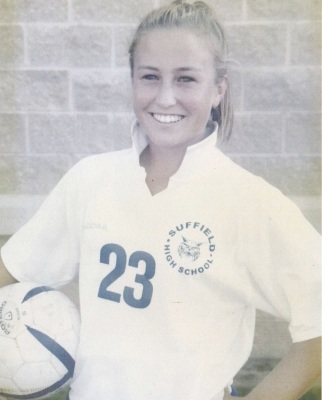 As a Wildcat Soccer player, she finished her high school career with 109 career goals, becoming the all-time leading goal scorer for Suffield High and also tied for fifth all-time for the State of Connecticut. Chloe was also Suffield High’s all-time career assists leader with 89. Those achievements helped her team win State Championships in both 2005 and 2006, in addition to being the runner-up in the state during the 2004 season. In recognition of her excellence, Chloe was All NCCC and All State four times, along with being named All New England and The Hartford Courant Player of the Year for 2006. In addition, Chloe’s leadership skills were recognized by her coaches and teammates as she was elected captain of her soccer team for both the 2005 and 2006 seasons. Incredibly enough, even though basketball was Chloe’s “second” sport, she is a member of the elite thousand point club for the Wildcats, while being a three-time NCCC All Conference selection and the team’s MVP for all four seasons. Chloe received a four-year scholarship and went on to play Division I soccer at Indiana University. She was a starter on the Hoosier team that reached the round of 16 in the NCAA Women’s Soccer Tournament in 2007. Along the way, she was named SoccerBuzz Great Lakes All-Freshmen team in 2007 and finished her career at the Big Ten Conference School third all-time for career assists and seventh all-time for career games played. This well rounded individual was also a Big Ten Conference Student Athlete. Chloe, being well respected by the Hoosier Soccer Staff, went on to become an Assistant Coach for her Alma Mater during the 2011 and 2012 seasons.